The Swedish School of Textiles is considered one of Europe’s most interesting education and research arenas. The Smart Textiles Design Lab turns textile traditions and concepts upside down through experimental research on new, expressive materials and construction methods. Design Lab also works to redefine textile design and the design role in itself by opening up for new design variables and new dimensions of expressions. Representatives for the Indian National Centre for Design and Product Development (NCDPD) visited Stockholm and the Swedish capital of textiles Borås in early April 2012. On this visit, organised by Invest Sweden, the four member senior team of directors were introduced to Swedish textile know-how, design, and materials technology primarily through the Swedish School of Textiles in Borås. An MoU on Indo-Swedish exchange in the area of design was signed, and according to Sweden Express, the quarterly newsletter of the Embassy of Sweden in India, the intent of the MoU was already being implemented. The agreement primarily aimed at facilitating an exchange of students and researchers, and letting Swedish students make project work in India. The real starting point of the collaboration was however born out of a study tour to the Indian state of Karnataka organised by Västra Götalands-regionen one year earlier, in February 2011 (“VGR goes Karnataka”, more information). Dr. Linda Worbin (photo above)from the Swedish School of Textiles was a member of the delegation, and she was invited to lecture at the Srishti School of Art, Design and Technology in Bangalore. It was not Linda’s first encounter with Indian textiles. Alreday during her BA education in 1999, she spent one month on an internship at the textile producing company Morvi Export and Asian Fabrics in Karur. She later wrote her PhD thesis on “Designing Dynamic Textile Patterns”. 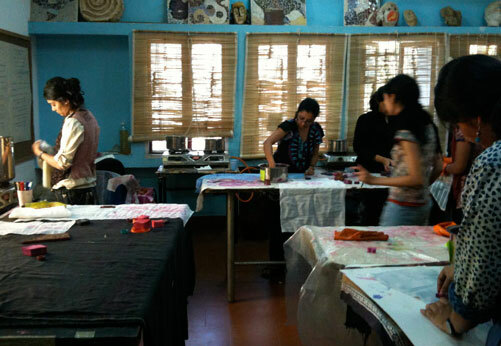 While being in Bangalore in February 2011, Linda Worbin was also involved in organising a “Conference of Failures and Social Design” in collaboration with Mili John Tharakan (photo), at that time working at Shrishti. At the workshop (see photo above), textile design students were introduced to smart textiles as Linda Worbin presented an overview of her PhD thesis. Mili John Tharakan is a Textiles artist researcher with an MA from Manchester Metropolitan University who loves to make things with her hands. Her work lies at the intersection of traditional crafts, textiles and technology. More information. Mili John Tharakan then came to Borås as a Visiting Researcher and spent first one month in June 2011 at the Smart Textiles Design Lab, and later a full year, 12 months during 2011-2012. Another key persons involved in the Indian collaboration project at School of Textiles in Borås are Erik Bresky and Eva Gustafsson.